Ambulances, fire trucks, and police cars save lives. When they are rushing by to get to an emergency, other motorists are required to get out of the way. When emergency vehicles with lights flashing are parked on the side of the road to assist others, drivers are expected to leave plenty of room and to slow down to prevent hitting emergency crews or their vehicles. You can only respond to emergency vehicles if you see and hear them. Turn down the noise in your car and be alert to the traffic around you. Always think three driving moves ahead so that your mind stays focused on driving. If you do see one emergency vehicle, be aware that there may be others nearby on route to the same site. Be prepared. 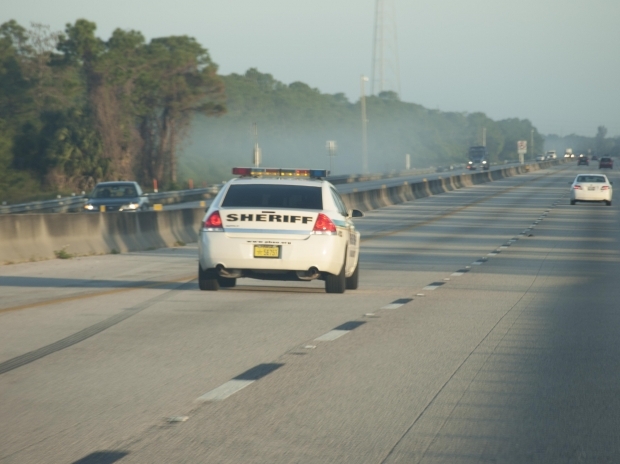 2) If you do see an emergency vehicle traveling with its signal and lights on, give it space. Check your mirrors and blind spots if you need to and pull over. Make sure to pull over to a space that has adequate room. Use your signals and stay calm as you pull over, since rushing and panicking can cause a collision. 3) Re-enter traffic once the emergency vehicles have passed. Once it is safe to return to your roadway, re-check to make sure the way is clear and use your signals before you make a move. Keep in mind that other drivers are also merging back into traffic. 4) Slow down and move out of the way if you see vehicles stopped on the side of the road. If emergency vehicles are stopped on the side of the road with lights flashing, slow down. Try to give them an extra lane of space. Be aware that emergency vehicles may pull out into traffic if they need to transport someone quickly. Emergency personnel may also be walking around the area, so be prepared for the unexpected. 5) Never follow or race emergency vehicles. Not only is this extremely dangerous and could end with your arrest, but keep in mind that someone’s life may depend on first responders arriving on time. Be courteous and stay out of the way so that emergency workers can do their job. If you have been injured or have had property destroyed by an emergency vehicle, contact Flaxman Law Group for a free case review. Our attorneys have more than six decades of combined experience representing thousands of plaintiffs in traffic accident and personal injury cases across South Florida. We work with a team of medical consultants, engineers, researchers, paralegals, investigators, and other professionals so that we can build strong cases on behalf of injured people like you. Give our law firm a call if you have been injured and would like to set up a free consultation to talk about your situation.